The annual Nuchigusui (health fair) was held in Kin Town today. All sorts of, good for your health, items were on display including food and drinks. They had health care specialists and, people who could give you massages. Fruits, flowers, vegetables, tonics and special ingredients, to lift your spirits, were available, too. The event most folks, come to see, is the butchering of the Maguro (tuna) and, they eat it. A few hundred images of that, are in my pending files, to be seen some other day. These little pigs called Agu (アグー) were a hot item today, as well. Some were cooked in smokers, others, sliced and grilled over charcoal fires. The Ryukyu pigs are special. Their pork contains less than 25% cholesterol. Genetics wizards claim the hogs came from China, hundreds of years ago. During the Battle of Okinawa, most of the livestock were destroyed. 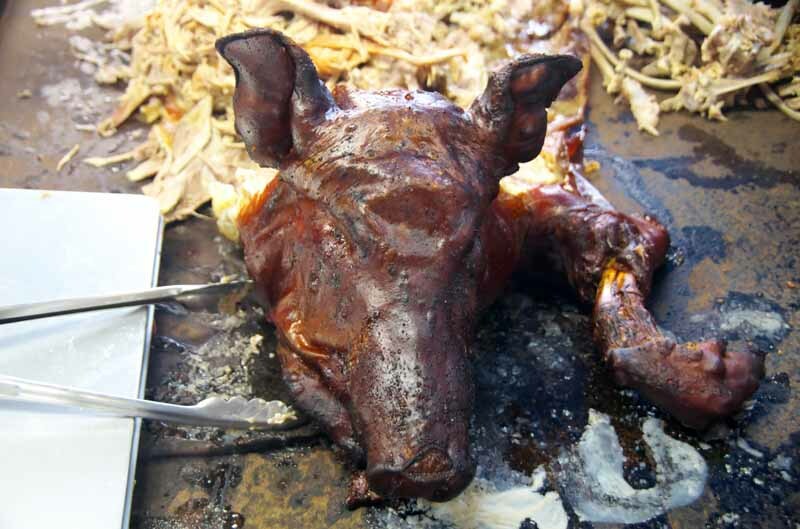 Pigs from Western countries, were brought to the island so, people could survive. Back during the 1980's someone, discovered Agu hogs, living in the wild up north. Eighteen of them were determined to be pure bred; not, mongrels mixed with other breeds. The little black pigs, called Shimabuta (locally) are making a comeback. The pork is tender and sweeter than, the average hogs farmers are raising. So, with the demand for healthy foods, on the increase Agu meat has become popular.